I recently bought the Phoenix R/C simulator. It comes with its own USB-cable to plug into your remote controller’s trainer cable. A friend of mine has a Spektrum remote, and the stereo 3.5mm jack plugs right is. I have a Futaba FF9 remote, so they wanted me to buy the “adapter cable to FF9” for €16. Since I already had the pinout of the FF9-connector figured out, I figured I could make this cable myself. Posted by Niobos on 2010-06-01 at 20:24 under RCheli. As a follow-up on my previous post on the Futaba FF9 trainer interface, I’m reporting the measurements of my E-Sky “0404” remote. Pin numbering is left-to-right, bottom-to-top: left-bottom is 1; right-bottom is 2; left-top is 3; right-top is 4; shield is all around. Posted by Niobos on 2008-06-07 at 11:10 under RCheli. Most transmitters have a “trainer” connection. This allows two remotes to be connected together. One is preforming the master-role and is actually controlling the model. The other remote is the slave and sends signals to the master. The teacher can program his master-transmitter to copy some of the slave’s signals, thereby letting the student control the plane. A simple toggle of the switch returns the control to the teacher. Obviously, each brand of transmitters has its own “standard” of doing things. 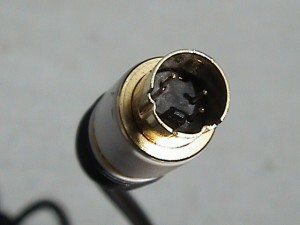 Some use a DIN6 contact, others use a mono- or stereo 3.5mm jack and there is the obligatory “proprietary connector”. Here are my notes of the expedition into the trainer-cable jungle. Posted by Niobos on 2008-06-05 at 17:39 under RCheli.